Renaissance theologian Rev. Osagyefo Uhuru Sekou has spent the last 30 years fighting the good fight through the artistic guises of author, poet, documentarian and public speaker. His debut musical project In Times Like These, an album recorded under the tutelage of blues brothers Cody and Luther Dickinson of the North Mississippi Allstars, seems like the next natural extension of his all-encompassing artistic approach to faith driven social justice. Unfortunately, In Times Like These is more of a mumbled lecture than an impassioned, God-fearing sermon of inspiration. Sekou certainly shouldn’t be blamed for this lack of spark. The seasoned orator turns in genuinely passionate vocal performances across the album’s 12 tracks, sometimes switching between throat shredding howls and silky croons all in the same song. It’s easy to imagine Sekou with knees bent on the studio floor, eyes squeezed shut as he roars the phrase “We who believe in freedom can’t rest now” during the album’s title track. It’s the sluggish instrumentation that prevents In Times Like These from rising above a just fine tribute to its historical source material. The Dickinsons’ golden organs, bass and Delta blues guitar tones certainly sound the part, but the performances, perhaps in a conscious effort to avoid overshadowing Sekou, sound uncertain and half-hearted. During “When the Spirit Says Move,” Sekou even steps away from the mic to allow the song to expand and breathe beyond its traditional 12-bar blues structure. Directionless lead guitar and hesitant splashes of organ only make the listener pine for the vocalist’s immediate return. Even summoning old ghosts through a cover of Bob Marley’s “Burnin’ and Lootin’” can’t conjure a soulful moment of inspiration. 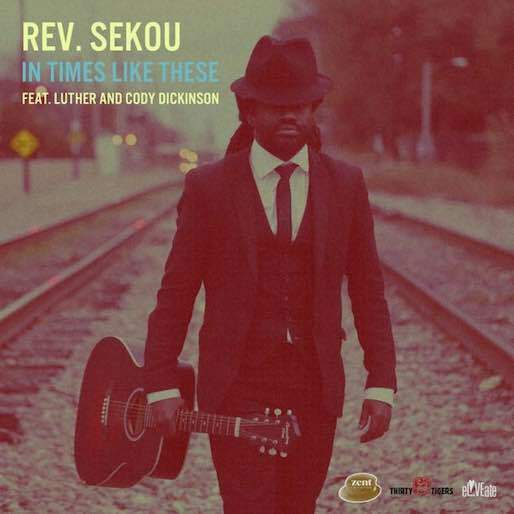 Sekou and his band replace the numbed reggae scratch of the original for a more urgent take that only adds an additional slogging minute to the original’s runtime. Beyond tepid songwriting and performances, head-scratching studio choices further sag the record. During the final minute of stone-faced slow burner “Will to Win,” backing vocalists begin a goofy and distracting chant that deflates the drama Sekou’s performance carefully built moments before. Several tracks also begin with audio samples of well worn blues tropes: the thwack of a chain gang’s pickaxe against rock (“We Who Believe”), a distant thunderstorm (“Muddy and Rough”), hound dogs barking (“Lord, I Am Running). These samples never build cohesion or add any sort of narrative theme to this collection of song and stick out more and more with repeated listens. Perhaps a crowd will inspire more fiery performances as Sekou and the Dickinsons take this material on the road. For now, these lukewarm performances only inspire tapping fingers and shrugs of indifference at what struggles the world has to offer.